When David Moss first meets Adam Codling, he is only hoping the other boy might allow him to share his canoe, which accidentally slipped away down the River Say and ended up behind his house. As the two boys get to know one another, however, David realizes that he and Adam have not just the canoe to bond their friendship, but a mysterious Codling family secret involving a hidden treasure and an easily misinterpreted clue. Though the treasure hunt is mainly a source of summer fun for David, it is much more for Adam, whose family is struggling so much financially that he and the aunt who is raising him may have to move away from their beloved riverside home. David wants nothing more than for Adam to stay, and for his family to find happiness again, but with Codlings' about to be sold, there isn't much time, or much hope, left. 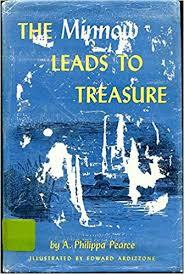 The Minnow Leads to Treasure (called The Minnow on the Say in the UK) is quite well-written, but unfortunately, the story didn't grab me as strongly as I had hoped. Philippa Pearce's Tom's Midnight Garden is one of my all-time favorite children's novels, and a unique and nuanced story, at that. By comparison, therefore, this straightforward mystery/adventure story just feels mundane. I also already have a good number of favorite mystery books involving British kids and boats (No Boats on Bannermere and The Big Six, for example), so I just didn't develop the same level of affection for these characters or this setting. There is nothing wrong with The Minnow Leads to Treasure, it just didn't rank as a favorite for me, despite my hope that it would. That said, boys, especially, who are interested in boats and enjoy solving puzzles and riddles will absolutely love this book. The chapters are short enough that it would make a good read-aloud, and the resolution of the mystery and how it is solved are satisfying and mostly unpredictable, at least until pretty close to the end of the book. The characters are also likable and believable, as are the reactions of the adults to their insistence on tracking down the treasure. Honestly, I think I'd just recommend reading this book before Tom's Midnight Garden. That way, this one doesn't feel like a let-down and Tom's Midnight Garden can really blow you away! Great review, and, for me, an introduction to a new children's author. Yes, not as good as Tom's Midnight Garden, but still it was fun to see the boys exploring in their canoe---all by themselves. I think that would be a great thing for children nowadays to read about.